Last week I had the opportunity to visit my PhD student Dorothy Maguire at her field sites south of Montreal. It was a glorious summer day, and given the construction holiday in Quebec, the travel time was quick and effortless (for Montrealers, you know what I am talking about!). I have briefly described Dorothy’s research in a previous post, and during the field visit, I was able to see Dorothy and her two field assistants ‘in action’. 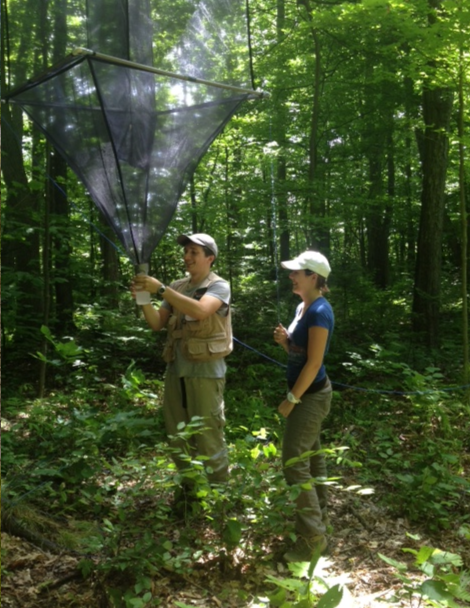 This included checking samples from an aerial malaise trap, beating the foliage (for herbivores) in the forest canopy, and checking contents of a Lindgren funnel (set up in the canopy to collect flying insects, including beetles). It was an amazing day for natural history. In fact, I sometimes think my graduate students cannot stand spending time in the field with me, since I tend to walk slowly, vial in hand, stopping all the time to pick up a spider or beetle, or to turn over a log to search for pseudoscorpions. I’m probably much more of a burden than a help in the field, and this probably leads to some resentment (ha ha). Anyway – it was great to get into the forest again after time in the Arctic, and I was thrilled at all the biodiversity starting me in the face. 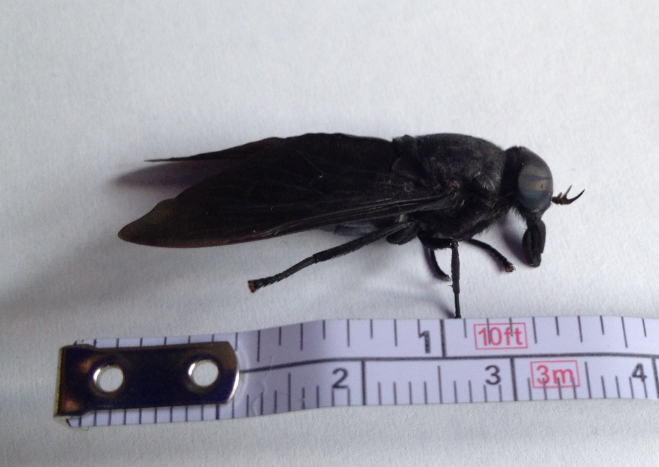 The BIGGEST horsefly that I have ever seen (probably Tabanus atratus). Yikes – I captured it before it bit me – it could have hurt. A lot. Some GIANT Scarabaeidae beetles – I don’t know the species but they were robust and impressive; masters of their universe. Dozens of Harvestmen (Opiliones), which I later identified as Leiobunum aldrichi – I have now started a colony at home (much to my children’s delight). 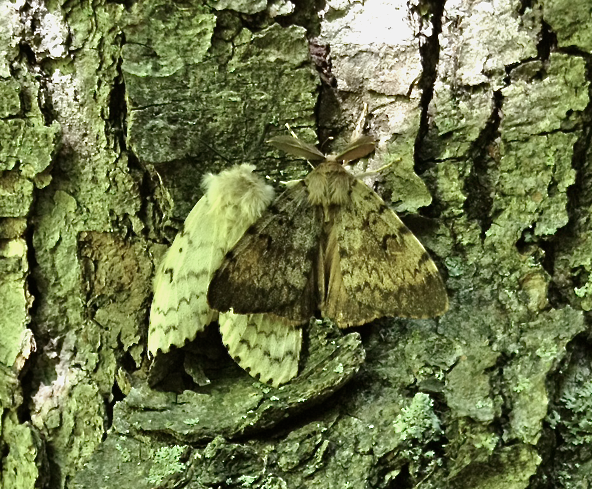 Female (l) and male (r) Gypsy moth, caught in the act. Gypsy moth (Lymantria dispar) – a lot of gypsy moth. This species in an invasive, introduced species. Gypsy moth caterpillars can feed on hundreds of species of trees, including our beloved Sugar maple. This is one species that I am not happy about seeing, and its numbers this year are certainly higher than last year. And to top it all off.. Antlions (Neuroptera: Myrmeleontidae). Yes, Antlions!! These are among the most fascinating of the insects -the larvae build conical sand-pits and await ants that happen to slip into the pit and fall down into the waiting predator. 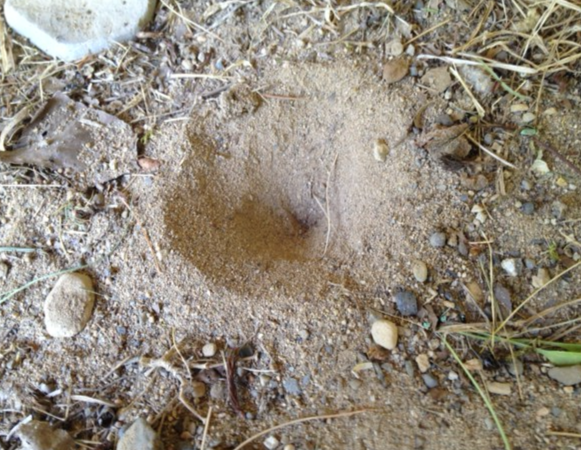 I have lived in the Montreal area for over 10 years and I had no idea that Antlions existed this far north. Wow. This is only part of the list, but one thing is clear – a hot, mid-summer day in a Montreal-area forest is full of the wonders of Nature. I didn’t have to look very far, and I didn’t have to look very hard. Furthermore, most of what I mentioned was all from a rather small forest fragment surrounded by agricultural lands. We must study, document, quantify the biodiversity within these forest fragments – they are very special, and they host a diverse and fascinating flora and fauna. Take a walk in your local woods, and see what you can find under leaves, bark, climbing up trees and catching a few rays of sun in a small clearing. It’s a nice way to spend a summer day.